Wayne Memorial Hospital’s Second Century Fund received a generous donation of $25,000 from the Wayne County Bar Association. The Second Century Fund, named in honor of Wayne Memorial approaching its centennial in 2020, was created to provide the resources to attract the best medical providers possible. It will be used to recruit healthcare professionals with greater incentives, to purchase state of the art medical equipment, implement future medical treatment modalities and acquire advanced informational technologies. 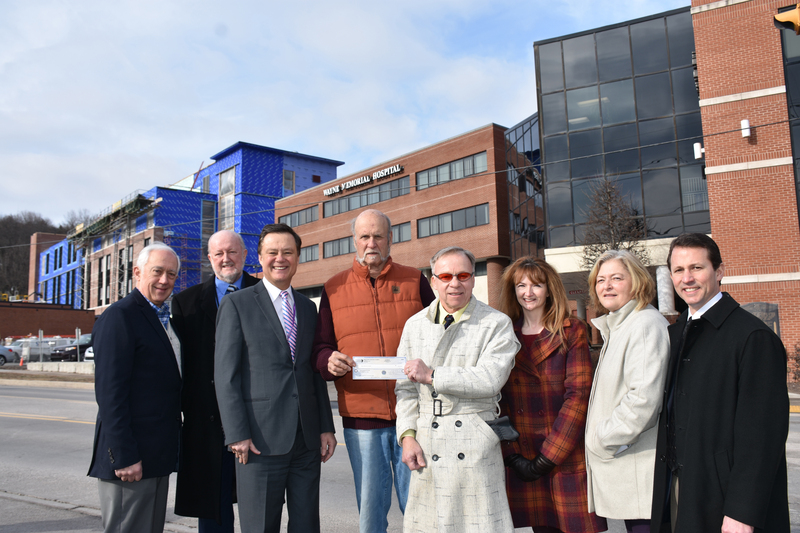 The Fund was launched as the hospital was nearing completion of its new 85,000 square foot tower housing 50 private patient rooms, a project that helped secure the donation. “This check indicates the very strong support that the Wayne County Bar Association has had for Wayne Memorial over the years,” said Ronald Bugaj, Esq., immediate past president of the Bar Association. “We saw what wonderful progress the hospital has made with this worthwhile project for the community, and the Bar Association supports it, supports the community, our hospital and particularly our fellow professionals, the doctors.” The Second Century Fund is a campaign of the Wayne Memorial Health Foundation.Photo, left to right: William Dewar III, MD, WMH Chief of Staff; Jack Dennis, executive director Wayne Memorial Health Foundation; WMH CEO David Hoff; Leonard Schwartz, chairman Second Century Fund; Ronald Bugaj, Esq. ; Pamela Wilson, Esq., president of the Wayne County Bar Association; Nancy Propst, chair Wayne Memorial Health Foundation; A.G. Howell, Wayne County Bar Association.